I love teaching Beginning Yoga students—even after a single practice many of them notice subtle changes in their body and breath, or in their state of mind. Their practice is infused with fresh observations, sparking the enthusiasm of discovery. This “beginner’s mind” can be fleeting, however. With time, what was once engaging becomes mechanical, and when it does, enthusiasm wanes—and along with it, the commitment to daily practice. As most students know, the benefits of practice are cultivated and strengthened by repetition over months and years. Consistent practice is essential, and to foster it we need to remain interested and engaged. The following tools for keeping practice fresh can help us sustain “beginner’s mind” and reveal a whole new world within our current practice. Lengthen the exhalation. Exhaling for longer than you inhale will promote relaxation and ease within the posture and can have a soothing effect. Lengthen both the inhalation and the exhalation. Lengthening the breath will energize your postures. Keep the inhalation and the exhalation equal. I often use this in my own practice for its grounding effect—it stabilizes my attention and focus. Gently extend the length of the pauses between each side of the breath. Notice if this deepens the effect of the breath or the posture. Directing your attention to different parts of the body in asana develops attentiveness. In addition, the placement of your attention can vary the effect of the posture. To demonstrate this, try moving into and out of the standing back arch (virabhadrasana) three times. During the first repetition, rest your attention on the soles of both feet; on the second, place your attention on the front thigh; on the third, focus your attention on the movement of your chest. Notice how shifting your focus each time changes your experience of the posture. The placement of your attention may be external or internal, gross or subtle. As you move through your practice, try observing the changing quality of your attention or the feeling at the center of the heart for a more meditative practice. I clearly remember my first sun salutation. It wasn’t easy—I had to concentrate on which movement accompanied an inhalation and which accompanied an exhalation. Now, years later, those movements are second nature and tend to become mechanical. I’ve found that one way to keep them fresh is to alter the relationship between moving to and from a posture with the breath and staying in a pose. To experiment with this, try adding a breath in the dog posture with each repetition of the sun salutation until you have built a five-breath stay. Or, using the same technique, build the stay in the upward-facing dog or the plank pose for a more energizing effect. Here’s my favorite method: throughout the sun salutation try staying for one breath in every posture into which you exhale (the forward bend, the dog, lowering the arms, etc.). These suggestions will work in any flowing sequence (vinyasa). A great way to change the effect of an asana is to break the movement down into smaller increments (krama). This brings a totally fresh way of experiencing movements we may have done hundreds of times. Let’s use the standing forward bend (uttanasana) to demonstrate: instead of exhaling all the way forward into the pose, go partially into the asana and stay for a breath (or more), before exhaling into the final posture. You can also create a stage as you come out of the posture, as illustrated in step 3. Or try creating more than one stage as you move into or out of an asana. Different stages create different sensations, providing a variety of structural effects as well as fresh observation. This sequence is intended to introduce these tools. As you begin to experiment with these suggestions on your own, start with one idea and apply it to different postures within your practice. Understanding each concept as it relates to a variety of situations will have a deeper effect over time than including them all in the course of a single practice session. 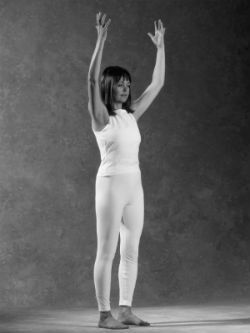 Stand with the feet parallel, hip-distance apart, arms relaxed at your sides. Inhaling, raise the arms to the front and over your head. Pause at the top. Repeat six times, carefully synchronizing the movements with your breath. Then go into the posture and stay for one breath. Lower the arms. Return to the posture for two breaths. Lower the arms. Continue adding a breath with each repetition until you have completed a four-breath stay in the posture. Suggestions: Before you begin, pause to observe how you feel. Take a minute to draw attention to your breath. As you begin practicing the arm lifts, link the duration of your movement to the duration of your breath. Then allow the breath to lengthen slightly with each repetition until you have reached a full, but comfortable, inhalation and exhalation. 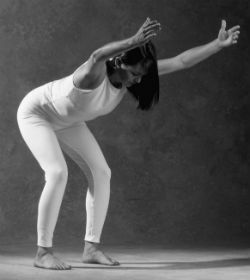 Stand with the feet parallel, hip-distance apart, arms relaxed at your sides. Take a few breaths before proceeding. Inhaling, raise the arms to the side and then over your head, keeping the elbows relaxed. Exhaling, fold forward, slightly bending the knees, and sweep the arms out to the side before resting the hands on the small of the back. Inhaling, lift your back, taking the arms out to the side and over your head as you stand, keeping the knees slightly bent until the end of the movement. Repeat four times, synchronizing your movements with your breath. Suggestions: Allow every movement to be initiated by the breath. Carefully link the duration of the breath and the movement, observing a natural but distinct pause at the top of the inhalation and at the bottom of the exhalation. Keeping the inhalation and exhalation equal, try extending the pause a second or two. Does it change your experience of the posture? Exhaling, slightly bend the knees as you fold forward, taking the arms out to the side before resting the hands on the small of the back. Inhaling, lift your back and come halfway up, reaching the arms out to the side. Exhaling, stay in the position. Inhaling, sweep the arms in front of you, opening the chest. Exhaling, fold forward into uttanasana, resting the hands beside the feet, fingers forward. Inhaling, lift your back, taking the arms out to the side and over your head as you stand, straightening the knees at the end of the movement. Repeat the cycle four times, adding a breath in uttanasana with each repetition. Suggestions: Did you stop breathing before you finished the movement? Did you move as slowly or as quickly as you were breathing? Notice if the different stages of the posture create a change in your breathing pattern or spinal sensations. Many students agree that the halfway position is actually more difficult than the final pose. Place padding under the knees as you come to a kneeling position with the wrists under the shoulders and the knees under the hips. Inhaling, move the chest forward over the hands, slightly arching the back and keeping the elbows soft. Exhaling, take the hips toward the heels as you fold over the thighs. Relax the shoulders and arms as they come to the floor. Inhaling, move the chest forward, placing the abdomen and knees on the floor, and lift the chest, arching the back. Exhaling, lower the chest and forehead to the floor. Inhaling, return to the lifted chest position. Exhaling, move the hips toward the heels, folding over the thighs. Allow the wrists to slide along the floor. Take a breath in place before repeating. Repeat six times, adding a breath in both of the positions into which you exhale. Suggestions: As you glide to and from the cobra pose, experiment with your hand placement. Feel free to adjust the hands (forward or back) along the floor to accommodate for your particular body proportions. Lie on your stomach and place your forehead on the floor, arms on the floor at your sides. Inhaling, raise the chest and both legs while sweeping the arms out to the side, away from the shoulders. Exhaling, release the posture, returning the forehead to the floor and the arms to the floor at your sides. Repeat four times, synchronizing your movement with your breath. Suggestions: Begin the breath before you begin moving. Stay with the feeling of the breath—it expands the ribs and fills the chest as you take the posture. Avoid pulling into the backward bend with your head. Lie on your stomach and place your forehead on the floor, arms comfortably on the floor at your sides. Inhaling, raise the chest and both legs while sweeping the arms out to the side. Exhaling, remain in position, keeping the elbows slightly bent, shoulders and neck relaxed. Inhaling, sweep the arms to the front. Keep lifting the back. Then add a breath in each position for two cycles. Suggestions: Notice the steps in this cycle. As you practice, wait for the breath to initiate your movement, and pause to feel the completion of each step. Do the steps increase the sensation of spinal extension? How does this affect your breath? Place padding under the knees. Kneel upright with the knees slightly apart and the arms comfortably at your sides. Inhaling, raise the arms to the front and over your head. Exhaling, fold forward over the thighs, sweeping the arms behind you, and rest the hands in the small of the back. Repeat six times, synchronizing your movement to your breath. Suggestions: Deliberately wait until every exhalation is complete. Fully release the head and shoulders as you fold over the thighs. Before proceeding, relax in the child’s pose for a few breaths, releasing the hands back toward the feet. Feel the breath moving throughout the entire back of the body. Sit on the floor with the legs in front of you. It may be more comfortable to place padding under the heels, which should be slightly apart. Inhaling, raise the arms to the front. Exhaling, fold forward over the thighs with the knees slightly bent, relaxing the arms to the floor. Inhaling, come up, leading with your chest, and take the arms over your head. Suggestions: Without forcing, experiment with extending the length of your exhalation, making it any amount longer than your inhalation. Explore the breath, allowing your body to move and release into the sensations of the breath as you move into and out of the posture. Keep the breath long and smooth. Lie on your back, feet hip-distance apart on the floor and arms comfortably at your sides, palms down. Pause for twelve breaths, fully releasing the back of the body into the floor. Link your attention to the breath before proceeding. Inhaling, press through the feet and raise the hips off the floor while lifting the arms to the floor behind you. Keep the elbows slightly bent and all parts of each foot firmly pressed into the floor. Exhaling, lower the hips and arms to the starting position. Repeat six times dynamically, linking your movement to the duration of your breath. Suggestions: Make your inhalation and exhalation the same length, still linking your movement to your breath. Does this stabilize your attention? End your practice by resting in shavasana for 3–5 minutes. Let your breath flow naturally.